Wear your team emblems or mascot with pride on your varsity letter, sports patch, or varsity jacket. 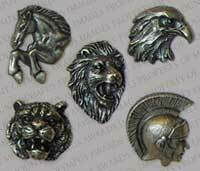 Our extensive collection of mascot letter pins is sure to have one that works for your school or organization. Made in high quality relief, the level of detail is stunning at a price that can't be beat!